Join us for our second Beer & Gin Bash, it's going to be a fantastic event with a great selection of real ales and craft keg beers, alongside a massive selection of premium gins, specialty vodka's and much much more! There's also a fun casino, live music, hot and cold food and a couple of ex Bradford City legends appearing! Tickets £5 and include a commemorative gin-copa or pint glass - tickets are available online via the Bingley Bantams website. From M62 exit at J26. Take M606 towards Bradford. At the end of the motorway do not take the slip road, continue straight ahead and follow signs for Ring Road East (under bridge) onto Rooley Lane (signs Leeds/Bradford Airport), with McDonalds on your left. Continue straight ahead, through traffic lights at ASDA Superstore, at the next roundabout turn left into Wakefield Road (A650). Stay in the middle lane and go straight ahead at the next two roundabouts, follow signs for Shipley and Skipton onto Shipley Airedale Road (A6037) which then becomes Canal Road. For administration offices, ticket office and Surridge Upfront - the Bradford City Sportstore, take the left before the petrol station into Burridge Street. First Bradford and Keighley and district buses from Bradford Interchange. Bus stops on Manningham Lane and Queens Road. 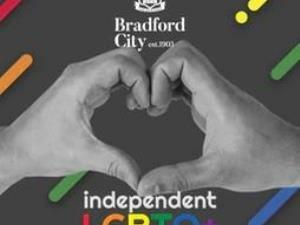 Trains to Bradford Interchange or Bradford Forster Square. National Rail Enquiries 08457 48 49 50.